Dúplex de 2-dormitorios con terraza privada, junto a la Plaza de la Magdalena y a sólo 5 minutos a pie de la Catedral. Está situado en una zona tranquila y a su vez muy céntrica, en un callejón peatonal a pocos pasos de las principales calles comerciales, Sierpes y Tetuán. 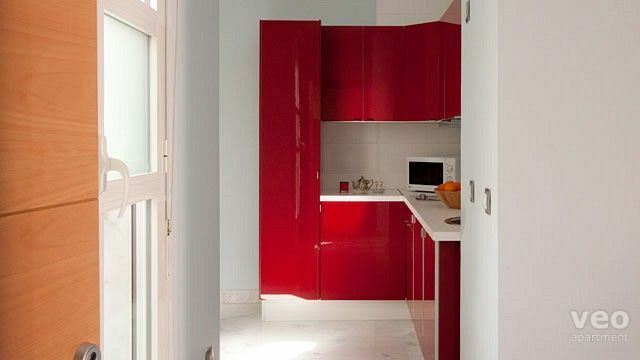 El apartamento está repartido en dos niveles. La planta inferior cuenta con un dormitorio con cama de matrimonio, un salón-comedor y cocina americana. Cuarto de baño completo con plato de ducha. En la planta superior se encuentra el segundo dormitorio con cama doble. 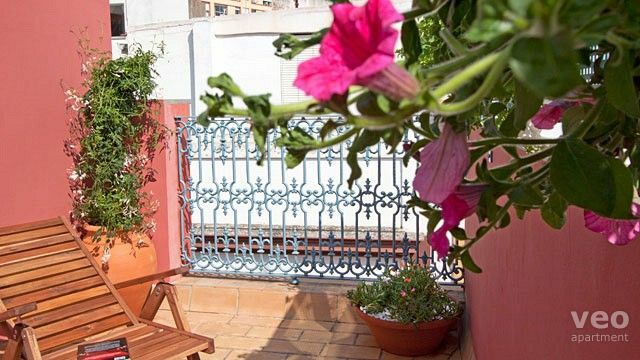 Desde aquí tendrá acceso directo a la terraza privada, que está decorada con plantas, muebles de jardín y dos tumbonas, para que pueda disfrutar tranquilamente del sol. Importante: las escaleras que suben a la planta superior no son adecuadas para niños pequeños o personas con movilidad reducida. 15:00 a 22:00h. Suplemento para llegadas después de las 22:00h: 20 EUR (a abonar en efectivo a la llegada). Limpieza: Cambio semanal de toallas y sábanas incluido. Schöne ruhige lage.... und gute Betten! 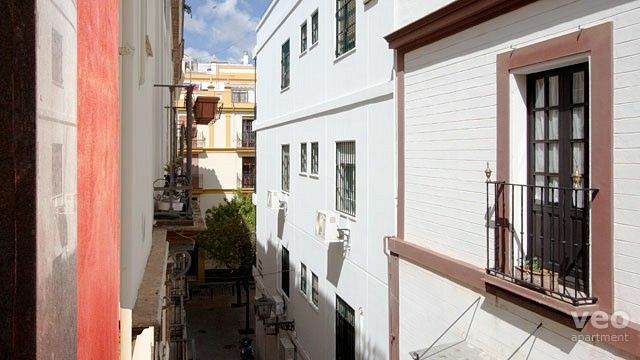 "Good location easy to access all of Centro Seville"
The apartment is situated in a short pedestrian zone.The entrance is secure, the apartment is two flights of stairs which was no problem. 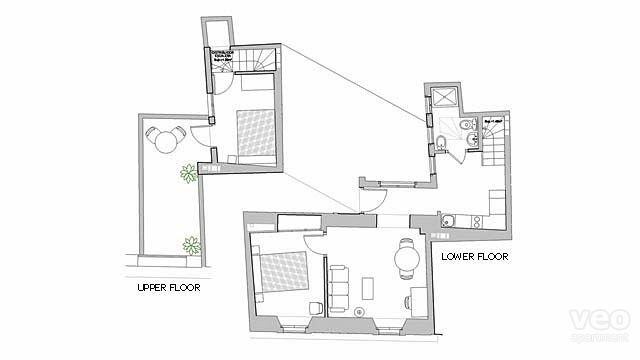 The first floor of the apartment is the main area, comfortable but limited space.The kitchen is relatively well equiped, the hob has two rings to cook on. As highlighted the stairs to the seconed level are steep, we are both active individuals but even so you have to take care, the prospect of carrying any food or drink while climbing stairs was not an option for us. 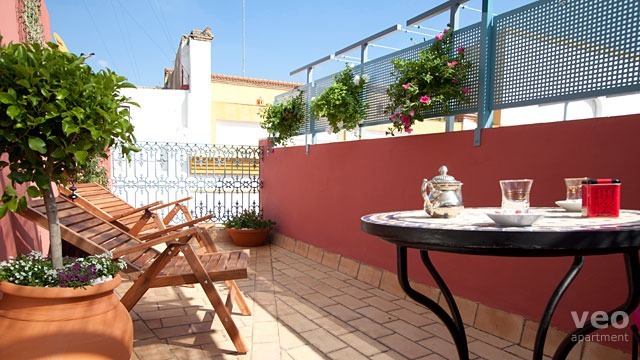 The terrace was to us disappointing in that the photos are not a true reflection of actual space, we have rented in Seville several occasions and always look for functional outdoot space, I dont think the terrace was functional, really not a space we would spend any time in. Apart from the terrace the apartment was very clean plenty towels etc.Our stay was cut short due to personal situation in UK which was unfortunate. 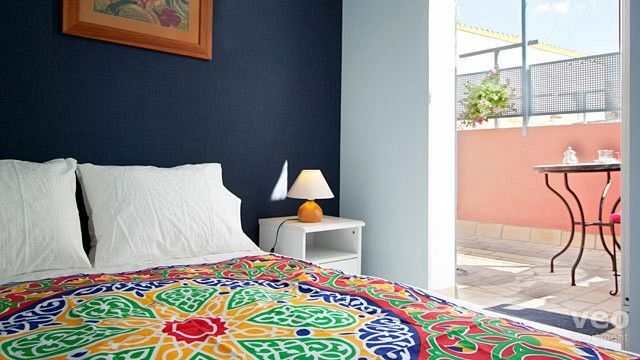 We have rented from VEO on 4 or 5 occasions and once again they gave an excellent service from booking to check in.To sum up I would say this apartment is about location and not about sun terrace. Es hat uns ausgezeichnet gefallen. Die Lage mitten im Zentrum ist hervorragend und ruhig!! Die Ausstattung hat alles, was ein Tourist braucht und ist in einem sehr ordentlichem Zustand. Está a 2 minutos de la plaza del Ayuntamiento. Perfecto para visitar Sevilla a pie. "Charmant appartement, on se sentait comme chez-soi. La terrasse c'est un plus pour l'apéro. " "Perfect location but a bit noisy at night"
Apartment was located in a perfect spot and had all the amenities we needed. The steep stairway to the second floor presented a challenge for carrying a baby and the outside noise at night was a concern. If the price were better we would consider staying again. "Location superb. Clean neat apartment, well equipped for limited self catering." Lovely third floor apartment ( we are much fitter now) with all those stairs. Small but perfectly adequate. Poor weather meant we could not use the roof top terrace but it was lovely. Would have benefitted from cushions for the chairs or sun beds. 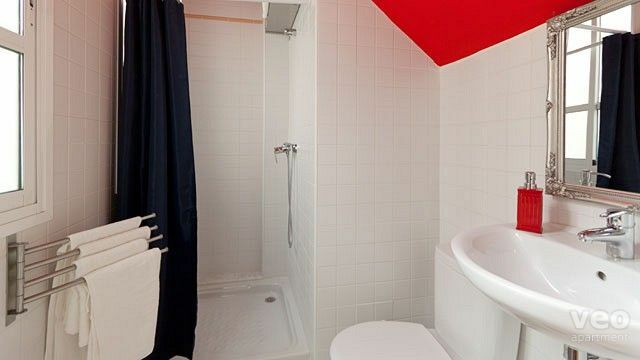 "Appartement très bien situé et très sympa"
L'appartement est sympa (les lits sont confortables) bien situé et propre. Vous pouvez tout faire à pieds. "Clean, functional, and well situated." Magdalena Terrace was clean, functional, and well situated. 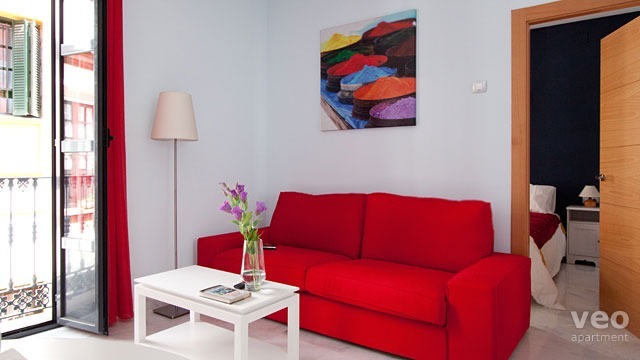 "Comfortable apartment in the heart of Seville close to many places of interest, bars and restaurants "
We enjoyed our stay and found the apartment to be clean comfortable and well equipped. We didn''t need to use cooking facilities as we ate out all the time. For breakfast there was a tradition Spanish Cafe just around the corner " Horneo San Buentaventura" which was excellent. On arrival we were met by a lovely lady who provided us with the keys and information. There was some noise at night but not more than one should expect in the middle of a busy town. "Trsè bonnes conditions de séjour "
appartement très bien situé, propre et bien aménagé. la cuisine équipée et la terrasse sont deux "plus" très appréciables. Le tout pour un prix très attractif. 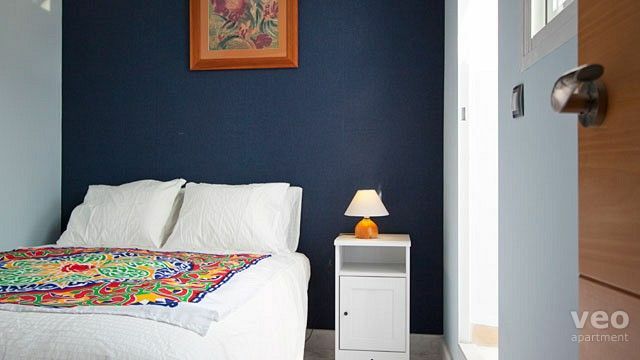 Clean, comfortable apartment, ideally located in the Centro district. 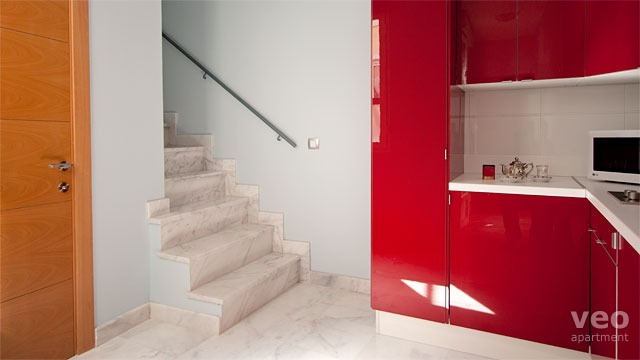 Steep stairs to second bedroom and terrace so would not suit anyone with mobility problems. Otherwise ideal for a short break. The apartment was in a great location--only a short walk to the major sights of the cathedral, Alcazar, shopping, etc. It was clean and veoapartment was kind enough to provide us with a baby cot even though we hadn't requested it in advance. It was also nice to enjoy the terrace and have amenities available like a washing machine. We'd definitely recommend this space. "Appartement très bien placé,en très bon état et propre"
"Centrico, muy cerca de puntos claves de la Ciudad." La estancia ha sido agradable, el apartamento estaba limpio, y quizás el incoveniente en la habitación alta, son las estrechas escaleras. "Clean, comfortable , great location!" 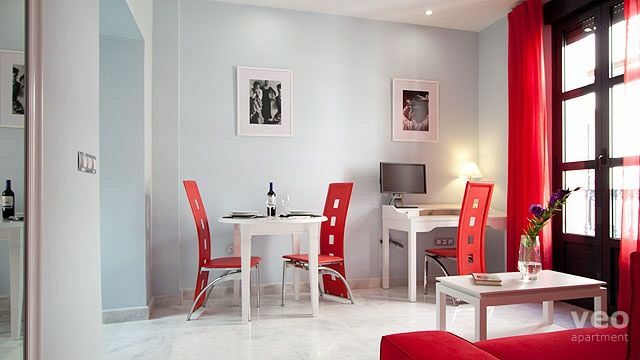 This apartment was in a very convenient, central location, making it easy to walk to see many of the sights. We didn't use any public transport or taxis, other than to get to and from the train station. 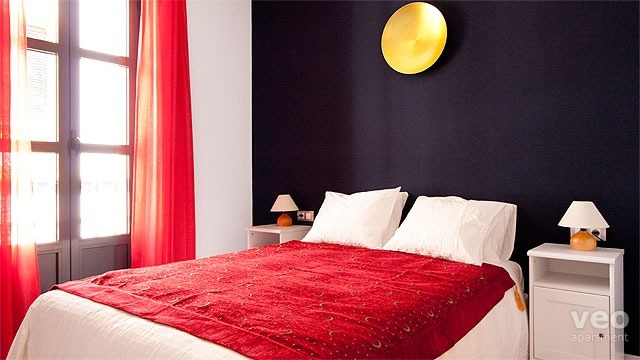 The apartment was very clean and comfortable and very well-equipped. The terrace was a bonus and we enjoyed relaxing out there on warm afternoons, though the stairs leading up to the 2nd bedroom and the terrace were very steep and narrow - not very child/elderly friendly.